Specialist of the shirt homme homme, www.chemiseweb.com also offers, through its brand Andrew Mc Allister, many models of shirts for women. It's been a long time since the shirt has been worn by men and more and more women want to wear women's shirts. We made it a point of honor to design a complete range of women's shirts on the quality standards of men's production in order to offer both elegant shirts and quality. At ChemiseWeb.com, the shirt for women is distinguished from the manners of the shirt man but the rules of the game are the same. If the cuts of our women's shirts are obviously different from the cuts of our men's shirts, the care we make for their making is similar. 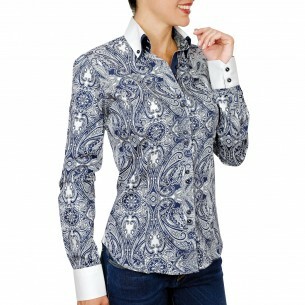 So, our women shirts are all at once, fashion shirts, original shirts and feminine shirts with exclusive elegance. The philosophy of ChemiseWeb.com is unchanged: to offer you a wide choice that will allow you to stand out with elegance. Our women's shirts are available in many colors and offer you the choice between different collars, different materials and different patterns so that each of you finds the woman's shirt that suits you. Webmenshirts.com: the slim fit shirt specialist! Big size shirt or large size polo shirt, what to choose?